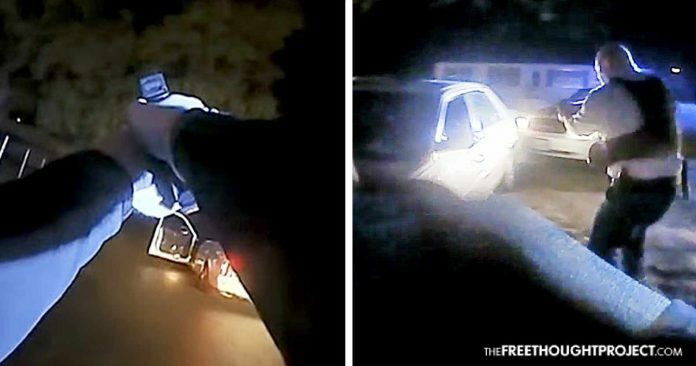 Disturbing body camera footage was recently released showing a North Carolina cop dump 8 rounds into a unarmed fleeing man's car during a traffic stop. Florence, SC — (RT) A volunteer constable in Florence, South Carolina fired as many as eight shots at a suspect as he attempted to flee a traffic stop, body camera footage from the officer reveals. State Constable Christopher Bachochin and Florence police officer Edward Seiben stopped the suspect, later identified as Brandon Fludd, at 11:10pm on Saturday night, March 24. After asking for his information, the officers asked Fludd to step out of the car, as they could smell marijuana. Fludd refused, took a drag of a cigarette, and reversed his car into a parked police cruiser, before driving away. As Fludd tried to make his escape, Bachochin can be seen stepping back from the car and firing up to eight shots at the vehicle. Fludd was wounded and taken to a nearby hospital, and was released on Monday, according to AP. No weapon was found in his car after the incident. — Teresa Galasso WBTW (@TeresaOnTV) 27 марта 2018 г. As a constable, Bachochin is a volunteer officer, and receives only a fraction of the training of a full-time police officer. State constables lack the power of arrest unless accompanied by an officer from a law enforcement agency. At the time of the shooting, Bachochin was patrolling with Seiben to keep his certification up to date. No other officer at the scene fired their weapon. Florence County Solicitor Ed Clements said it was likely that the wounded driver would face charges of failing to stop for police. The state attorney general’s office will decide whether to prosecute Bachochin once an internal investigation is finished. Bachochin has been suspended from duty since the shooting, and the Florence Police Department is reviewing its ride-along policy.